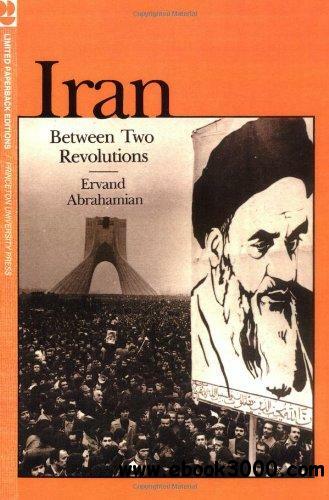 AMONGST THE myriad of books about Iran which have appeared over the past few years, one work stands out as a unique contribution to modern Iranian history: Ervand Abrahamian, Iran: Between Two Revolutions (Princeton University Press, 1982, 562 pages, cloth £31.80, paper £10.30). Although it covers a long period - from the late nineteenth century and the constitutional revolution (1906-11) to the late 1970s and the Islamic revolution (hence the title of the book) - it is unique in its detailed and in-depth coverage of a very important period of modern Iranian politics: 1941-53. No other book covers this period of social upheaval and political struggles at the same length and based to the same extent on original documentation. This is significant, because the politics of that period have left their deep imprint on the subsequent period down to the present day. The argument is novel and brings to the fore a frequently ignored aspect of the sociopolitical structure of nineteenth-century Iran. (The work of the prolific twentieth-century Iranian historian and author Ahmad Kasravi is a notable exception.) None the less, presented as the central obstacle to the emergence of a bourgeois political order in Iran, the argument is unsatisfactory. Many of the present-day nation-states also grew out of a heterogeneity of ethnic and national groups. Some are still substantially segmented along such lines. Amongst the more recently established states, India is a striking example of a divided 'nation' and yet, compared to many other post-colonial states, it has a much more cohesive bourgeois political system. In Iran itself, despite all the tribal, ethnic and religious divisions, a movement developed towards the establishment of a modern parliamentary system, with political and intellectual leaders sharing a vision of replacing the Qajar autocracy with a strong reformist central authority based on a secular constitution. The constitutional revolution - against the combined forces of the Qajars, some of the tribes, an important sector of the clergy and even the help of Tsarist Cossacks - succeeded in establishing a constitutional regime. And yet it failed to bear the promised fruits of 'civilization and modernization'. It began to collapse almost as soon as it had declared itself. Was this because the multiplicity and depth of tribal/ethnic/religious divisions had prevented the shaping of a cohesive class with a developed sense of purpose and social outlook? Abrahamian's third chapter on the background to the emergence of Reza Shah (1909-21, The Period of Disintegration) sheds more light on this issue. The debates and divisions in the second Majlis (parliament) were not along ethnic and religious lines, but over political and ideological issues: over what reforms were necessary in governmental structure, laws, education, economic policies, land titles, banking, commercial and industrial policies, and so on. The problem was that the Iranian middle class, unlike its European counterpart from whom it had taken its political ideas, did not have the social and political base that would embolden it to carry out the necessary reforms to do away with an archaic system. It was tied to the clergy, so it could not be secular enough. It was a landed class - since the commercial interests had been buying state lands over a long period - so it could not be socially radical enough. It was deeply interconnected with European industrial and commercial concerns, so it could not be nationalist enough. This was another aspect of the Iranian middle class's dilemma: many of the economic and political measures that it needed to carry out in order to remove some of the obstacles it had faced during the Qajar period would bring it up against the European powers, particularly Britain and Tsarist Russia. But it owed its own growth and prosperity- not to mention its political ideas - to Europe. All these problems more than explain the indecisiveness and oscillations of the political leaders of this class. Even Reza Shah, with his brute military 'decisiveness', could not get very far in tackling these problems. His secular reforms, for example, and those followed up by his son Muhammad Reza Shah barely scratched the surface. It was possible, within the short space of three years and without meeting much popular resistance, for the Islamic regime to undo all the secular institutions built up over some sixty years. In fact, one could argue that the parliamentary leaders of the constitutional revolution, having felt their own impotence in dealing with the country's problems, sought in Reza Shah a 'superman saviour' who would achieve through force what they had failed to do through parliamentary experiments. Many of them complained about his dictatorial methods, but they generally gave him their support and often participated in his administrations. The popularity later enjoyed by Hitler amongst certain layers of Iranian nationalists was not simply an ideological/mythical return to Iran's past 'Aryan' glories (which was admittedly a strong element in the anti-Arab consciousness of Iranian nationalists); it was also based on the belief in the necessity of a strong military figure to head 'national progress' and overcome backwardness. The richest and most important part of Abrahamian's book is Part II, 'Politics of Social Conflict'. It covers the period 1941-53 in much greater detail than any previous work. Compared to Part I it is more descriptive than analytical, but this is partly because the absence of any comparable history necessitates such minute descriptions of events. The bulk of Part II consists of a study of the Tudeh Party; as Abrahamian explains in the Preface, the book itself 'began in 1964 as a study on the social bases of the Tudeh Party'. It is all the more surprising that there is no satisfactory explanation for the failure of this party, despite its growth and increasing popularity over a prolonged period of political activitism (1941-53). The picture presented is of a party of immense industrial muscle, having succeeded in unionizing the modern working class as well as sectors of traditional craftsmen and state employees; a party with almost total hegemony amongst intellectuals and political writers; a party with vast mass influence throughout society, including the government apparatus and the army. Coming from a historian of Iran's two revolutions, this sociological pre-determination is somewhat surprising: after all, both the constitutional revolution and the Islamic revolution were urban revolutions with no peasant uprisings involved. The constitutional revolution was confined to a few major cities; to the extent that some tribes were also involved, they constituted military units, some fighting for and some against the constitutionalists. The Islamic revolution was much more national; it involved all the major cities and towns, but still there were no peasant uprisings. To the extent that there was any 'rural component', it was in the participation of migrants to the cities, rather than any rural upheavals as such. All peasant activities effectively started after the old regime had collapsed, rather than causing its collapse. None the less, both revolutions succeeded in taking power and neither was sociologically doomed to failure from the outset. Moreover, to expect the army rank-and-file to revolt before any uprising amongst the civilian population is to expect the impossible. In no revolution in the past, anywhere in the world and with no matter how much rural involvement, has the army rank-and-file refused orders unless the strength of the revolution has already demonstrated the possibility of a victory. To do otherwise is plainly suicidal. Even more astonishing is the certainty with which Abrahamian asserts that with a rural rebellion (or an army revolt) the Tudeh would have tried to make a revolution. There is no evidence for this assertion. On the contrary, from his own presentation of Tudeh literature and internal discussions throughout this whole period, it is quite clear that the party never saw itself as a party of a Bolshevik-style revolution. Its initial positions had specifically excluded the possibility and necessity of a revolution in Iran, had considered the country 'premature' for revolution, and had set the party the task of uniting all progressive forces to weaken the ruling class and to strengthen the forces of democracy. (p285) Although over the subsequent few years the Tudeh, both in theory and in practice, put much greater emphasis on the working class, small producers (craftsmen), state employees and intellectuals, none of its work was directed towards the aim of making a revolution, much less a Bolshevik-style one. It continued to view itself as a party of opposition rather than as a party of government. It continued to emphasize its task as that of helping 'the national and democratic forces' against 'reactionary oligarchies'. Despite its industrial muscle and organizational strength, it remained politically weak. In fact, because it saw its role as an 'auxiliary' one, it made crucial concessions in important political and industrial clashes whenever it was faced with a decision to challenge decisively the government of the day (for example, in the important industrial disputes of Isfahan and Abadan, and the party's failure to mobilize nation-wide support for the struggles in Azarbaijan and Kurdistan). These successive concessions paved the way for further clamp-downs on the party resulting in irreversible losses for the Tudeh. Even its short-lived left zig-zag (in 1951-53) was directed not at leading the working class to power, but simply at attacking Mossadeq, much in the same manner as it had opposed the Shah and some of the previous prime ministers. It opposed Mossadeq without projecting and building any positive governmental alternative. It is not clear why the same approach could not be followed in evaluating the failures of the Tudeh and, by contrast, the success of the present-day Islamic political currents (from Khomeini to the Mojahedeen). In discussing the recent events in Iran, the issue of the past record of the Tudeh (and of the National Front, for that matter) is not even raised. None of these weaknesses, however, undermines the value of the book as a history of the period for which it was initially projected (1941-53). On that level alone, Abrahamian's work remains a unique contribution.